Seals in the Ythan estuary. An investigation is under way after two dogwalkers invaded a legally-protected seal colony. The spot at Forvie Nature Reserve is a designated haul-out site, making it an offence to intentionally or recklessly harass seals in that zone. 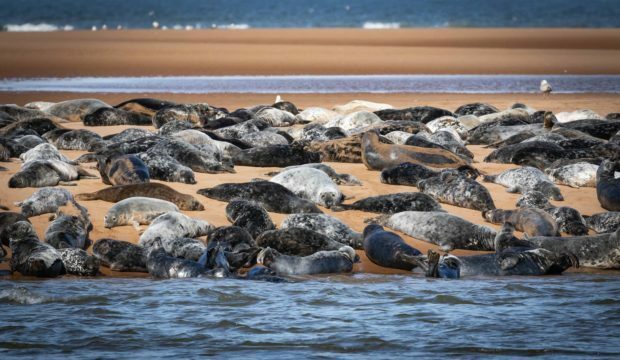 But on Saturday, volunteers from Ythan Seal Watch spotted two men ignoring the barrier fence and approaching the seals with their two dogs – causing the mammals to “stampede” into the water. A volunteer said: “Two males walked around the front of the barrier fence on the Forvie nature reserve at the seal haul-out and stampeded the entire seal colony off the designated area of beach. “We estimate this to be around 1,000 grey seals. “The beach the seals are on is designated by Marine Scotland to legally protect the seals from intentional or reckless harassment whilst they rest and breed on the reserve. “We have been filming visitors disturbing the seals for four years now and this is the worst disturbance we have filmed. We have never filmed this amount of seals being removed permanently from the site. In Ythan Seal Watch’s 2017/18 report, published on August 12, there were 35 cases of people causing a large number of seals to flee into the water. During stampedes into the water, the smaller seals can be crushed to death in the panic. Furthermore, there were 19 instances of people deliberately encircling seals on the site, and 31 reported cases of people ignoring warnings and walking past the barrier fence. Anyone cause disturbing the seals can be fined up to £5,000, or even time behind bars. The seals can be safely viewed from behind the barrier fence at Forvie Nature Reserve, or on designated walkways that provide views of the sea creatures. A police spokesman said: “We received information about an incident at Forvie Nature Reserve on 1.45pm on Saturday afternoon. Wildlife Crime Officer PC Doug Darling said: “We received information about an incident involving dogs at Forvie Nature Reserve which happened at around 1.45pm on Saturday August 25. “Under the Marine Scotland guidance it states that where there is intentional harassment of an animal this would include any action that causes a significant proportion of seals on a haul-out site to leave that site either more than once or repeatedly or, in the worst cases, to abandon it permanently. “The circumstances have been reviewed and we are content that there was no criminality on this occasion.